A year or two ago, this card would have been great. Now, not so much. Why do I say a year ago? That long ago, we didn't have an 8-star Morphable fusion until we got Gatling Dragon. That, and both Cyber Twin Dragon and Gatling Dragon are better than this card ATK-wise. So what do you get for using Frogs? 2500...+ 500 points for every copy of Treeborn Frog in your Graveyard. Wait, lemme translate that. 2500 + 500 for every copy of a restricted monster you should be summoning to the field that's left in your Graveyard. So this thing maxes at 3,000. Crap. There's no problem with just having the card in your fusion deck, and it DOES get a 5/5 for that, but as for actual usefulness, your Metamorphosis and effort spent actually Fusion Summoning something should go to better cards. Dark Paladin Today we'll look at a new Fusion that was hurt by the new Ban List. D.3.S. 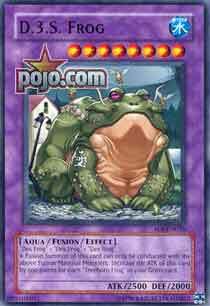 Frog is a decent Fusion monster with 2500 attack points, so it's fairly strong. It doesn't have that great of an effect anymore, but if you get the copy of Treeborn Frog you're allowed to the Graveyard, our Frog friend gains 500 attack points. Which gives him potential for 3000 attack points (or 4000 until Saturday). Go ahead and play him in your Frog deck, as it's the only place it belongs. If you have 3 Des Frog's on the field, play Des Croaking! It at least takes the cards away from your opponent! Any effect which solely increases ATK a bit is not worth the bother (Lily is not included in this general statement as 3000 is not a bit in any way). Especially when that ATK increase is dependant on a Restricted monster. Do not play. I don't care if fusions don't have a drawback. Unfortunately, as it stands, this is not up to scratch. Art : 4/5 That’s a fat frog…. Wow, a fusion frog that has been hurt by treeborns restriction. As far as fusions go, a four card investment to bring this out is not cool. Its effect no-longer makes it a giant threat, and it looks dumb.